THE IDES OF MARCH – GOLD AT $14,463 and SILVER AT $669 — Maybe not, but are we on the way? In the Roman calendar, the Ides of March was the same as March 15th in today’s calendar. This date was not significant until Julius Caesar was assassinated on 15 March 44BC. Shakespeare then coined the phrase “Beware of the Ides of March” in his Julius Caesar work. So will March 15, 2017 be significant. We will soon know. There are some noteworthy events taking place on March 15. The debt ceiling must be reset that day and the Fed also meets to discuss a rate hike. In addition, there is the Dutch election on the same date and 8 days later the French election starts. In normal circumstances, none of these events would be earth shattering or have major consequences for the world economy. But we don’t have a normal world – far from it. We have a world which is financially and morally sick. Regrettably the condition is so dire that there is no cure for a reprobate world. A 100-year debt explosion has created a timebomb waiting to explode. Very little is required to light it. As the biggest economy in the world, the US obviously has the biggest debt with a total of $65 trillion. To this we need to add unfunded liabilities of around $200 trillion and derivatives of circa $500 trillion. Thus, we are looking at a total US “risk” of $3/4 of a quadrillion. Many critics would say that this is a vastly exaggerated figure since it won’t all be payable in one go. But that risk is much greater than anyone can imagine. Let’s just assume that there will not be an early agreement to increase the debt ceiling. That would trigger major falls of the dollar and bond markets and probably also the overvalued stock market. The repercussions would be higher rates, higher import prices, bigger budget and trade deficits and more money printing. Inflation will increase rapidly and eventually as the dollar falls precipitously, it will lead to hyperinflation, more money printing, yet higher rates in an unstoppable vicious cycle. The derivatives market which is extremely sensitive to higher interest rates would also come under pressure leading to more money creation by the Fed. There are major forces in the US who want to totally paralyse Trump’s ability to govern the US. This will make it virtually impossible for the current administration to govern effectively. As the financial crisis accelerates, there will be even more pressures to oust or impeach Trump. This situation will be disastrous for the US as well as for the world economy. The whole process could drag out and last until the autumn of 2017 and it could start in earnest with the Ides of March. In October 2015, the US debt ceiling was suspended until March 15, 2017. The debt ceiling is of course a total farce. It has been raised 95 times since 1940 and 14 times in this century. Every single administration has totally ignored the debt ceiling and just raised it to accommodate their irresponsible budgeting and spending. All with the purpose to buy votes and to line the pockets of the banking sector. The chart below shows the debt ceiling and the gold price. There is now a clear disconnect between the credit expansion and the lagging gold price since 2011. This divergence will soon be rectified, gold will not only catch up with the debt expansion but will overtake it. The problem is firstly to reach an agreement which will be a mammoth task. Secondly, the increase in the limit required is so big that there will be massive reluctance to accept the magnitude of it. Since 1981, the US debt has doubled every 8 years. This means that by 2025 US debt will be $40 trillion at a minimum. But with the problems in the US economy that I outlined above, the level is likely to be considerably higher. So a likely increase for the current year would be $2 trillion at least. It is unlikely that such a high increase would be approved which means that the farce will continue. There is now a 95% certainty that the Fed will increase rates at their March 15-16 meeting and that there will be more increases in 2017. The US 10-year Treasury yield has already gone up by 25 basis points in the last 7 days. This will put more pressure on the US budget and debt ceiling as the cost of financing the $20 trillion and growing debt continues. It now looks that inflationary pressures are starting in earnest. The official inflation figures are substantially below what ordinary people experience when they buy their food or pay for their health insurance. But even the official inflation figures are now indicating that inflation will grow rapidly. In the last two years, inflation has gone from 0% to 2.5% which is a 5-year high. As the dollar falls and velocity of money increases we will see inflation increase rapidly. It could easily reach 10% in the next couple of years. That might seem incredible today. But it happened in the 1970s when the 10-year Treasury went from 7% to 16% in 4 years. In the UK, the inflation rate was in the teens between 1972 and 1980. I remember it well. My first mortgage went up to 21% in the mid-1970s. I wonder how many people today can hold on to their houses at that kind of rate. Probably less than 5%. The same is happening in the EU. Inflation is back and on the way up to much higher levels. From -0.2% a year ago, EU inflation is now at 2%. Like in the US, we will see EU rates climbing above 10% in the next couple of years and ultimately a lot higher as inflation turns into hyperinflation. The currency debasement will continue in the race to the bottom. It is difficult to predict which currency will win this race since most of them are worthless. They will all go to ZERO but not at the same time. The whole world is betting on the dollar to be stronger for quite some time and the Euro to collapse. This sounds plausible but it looks to me that the majority will be wrong like they normally are. Looking at the Euro against the dollar, it seems that the Euro will strengthen next and the dollar will lead the race to the bottom. Euro vs Dollar chart below shows Bullish Divergence on the monthly momentum indicators. This indicates that the Euro has bottomed and the dollar will weaken over the longer term. It might be surprising that the Euro will be stronger than the dollar. Firstly, we must remember that this is a relative game. All the currencies are rubbish since they have been destroyed by money printing and credit creation. It is only a question which one will go down next. The dollar is massively overvalued and is only still standing due to its reserve status. Possibly the Euro will be temporarily stronger due to coming changes in Europe. If Greece, Italy and Spain pull out of the Eurozone, the remaining economies will be much stronger and at least short term, this would justify a stronger Euro. The imminent elections in France and the Netherlands will give us an indication but are unlikely to be conclusive. Bitcoin has performed very well lately as the world tries to avoid fiat currencies. We have just seen the Bitcoin price go higher than the gold price. This is a meaningless comparison. The total market value of Bitcoin is $20 billion whilst all the gold in the world is worth around $7 trillion. Bitcoin might continue to be an excellent speculative investment but is has nothing to do with wealth preservation. It can only be stored electronically and can therefore disappear when there is a breakdown of the internet, at least temporarily. Bitcoin is very similar to paper money and has no intrinsic value. It cannot be used for any major payments crossborder. If Bitcoin or other cryptocurrencies ever become big, governments will regulate this market in the same way as paper money. 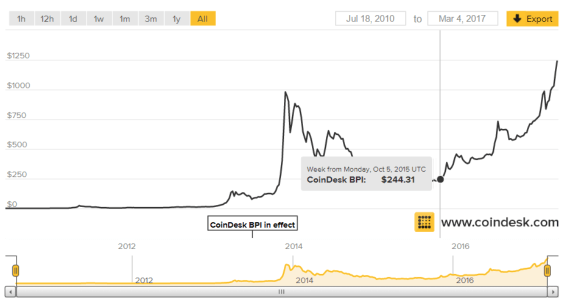 Having said that, Bitcoin has performed extremely well as an investment. It was worth $244 in October 2015 and is now over $1,250, a 5x increase. During the same period gold has gone up 6%. It is likely that we will see a similar performance in gold and silver starting soon. The Ides of March could contain many surprises that will act as a catalyst for the precious metals. The attack on silver on March 2, was another desperate attempt to stop silver from the inevitable price explosion that we will soon see. After the close of the European market on March2, $2 billion of futures silver contracts were sold in less than 25 minutes, pushing the price down by 65 cents. Over 1 ½ months’ annual silver production was sold in a few minutes in a thin market where there were no buyers. Nobody of a sane mind would execute such a trade for a commercial purpose. This was manipulation of the highest degree by a major bank with the blessing of a central bank or the BIS. The clear intention was to try to prevent the major losses that the short sellers in silver will incur in coming months and years. The market will soon slaughter these short sellers. I have since 2002 been predicting that gold will reach at least $10,000 in today’s money and silver $666 based on a gold/silver ratio of 15. With the coming hyperinflation, these figures will of course be a lot higher. The gold and silver charts below show that these are not unrealistic targets. 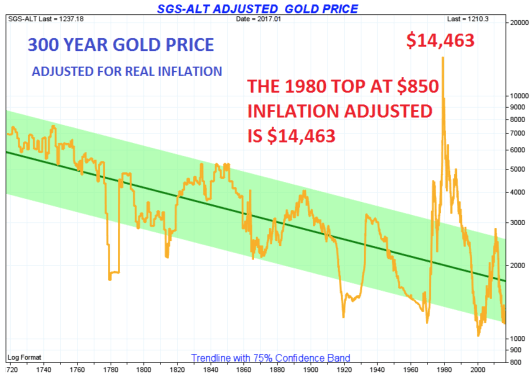 The 300-year chart of gold adjusted for real inflation shows that gold is now at the bottom of the range. Even more interestingly, the $850 top in January 1980, adjusted for inflation, would be $14,463 today. 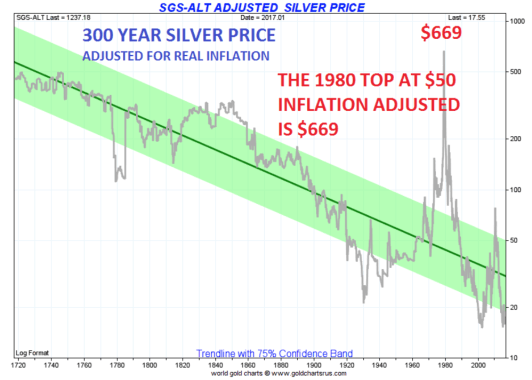 The 300-year silver chart, adjusted for real inflation confirms that the 1980 $50 top would be $669 today. 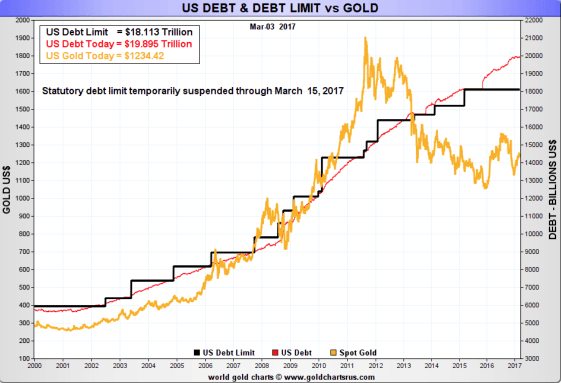 So in 2017, we are likely to see gold and silver reflecting all the major global risks as well as the continued growth of US and global debt. Also, the severe shortage in physical precious metals that will occur as the manipulated paper market implodes will have an explosive effect on metal prices. But physical gold and silver should not be considered as an investment. Whatever price they reach is almost irrelevant compared to the protection they will provide against imploding currencies and a rotten financial system.